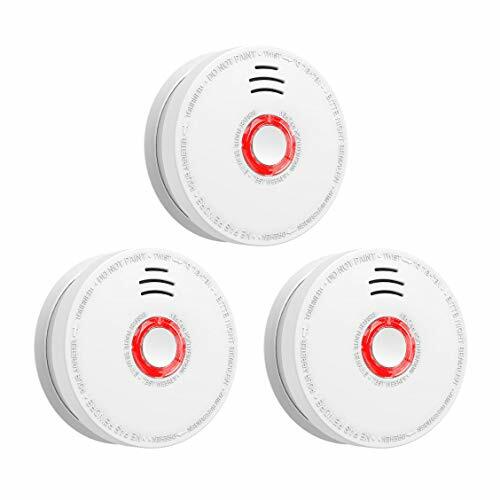 SITERWELL Smoke Detector and Fire Alarm 3 Pack DC 9V Battery (Included) Operated Photoelectric Smoke Alarm with Test Button, UL Listed. Fire Detector for Home Hotel etc. Complete Home Protection: Working smoke smoke detector cut the risk of dying in a home fire by 50%, and that's important because a home fire starts every 83 seconds! The faster you know about a fire, the faster you can escape from the fire. The battery-powered SITERWELL Photoelectric smoke detector is designed to protect you and your family from the dangers of smoke and fire. The photoelectric technology, it is more sensitive in detecting slow smoldering fires which generate light smoke, little heat and may smolder for hours before bursting into flames. This smoke alarm does not contain any radioactive material..
Easy installation:no wiring required Powered by 9-volt battery (1 year battery include) for continuous protection even during power failures Flashing LED shows alarm is receiving power Low-battery indicator 10-year limited warranty . LED indicators: This smoke alarm is equipped with red LED indicators. Low battery trouble indication: An intermittent "chirp" accompanied by a red LED flash every 32 seconds indicates a low battery. Danger: If the alarm sounds, and it is not being tested, it means the unit is sensing smoke, The sound of the alarm requires your immediate attention and action. It includes a flashing red LED to indicate the alarm is receiving power as well as a test button to verify the unit's electronic circuitry, horn, and battery functions are working properly. During a smoke incident, the smoke alarm will sound in a repetitive manner. This smoke alarm dose not contain any radioactive material.Smoke alarms should be installed in every room (except the bathroom ),finished attics and basements, making sure the people in the home will be able to hear and respond to the alarm sound.